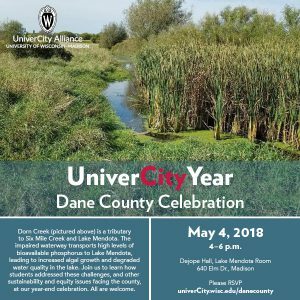 When: Friday May 4th, 2018, 4:00 p.m.
Help us celebrate the UniverCity Year Dane County partnership on May 4, 2018 at Dejope Hall. More than 350 students and 16 faculty members worked on projects for the Dane County Board of Supervisors during the 2017-2018 academic year. Come meet the teams, learn about their work, discuss next steps with Dane County staff and enjoy a complimentary assortment of hors d’oeuvres and beverages. All are welcome to attend. Please RSVP by April 25 to help us plan for food.